Merry Christmas to those celebrating. 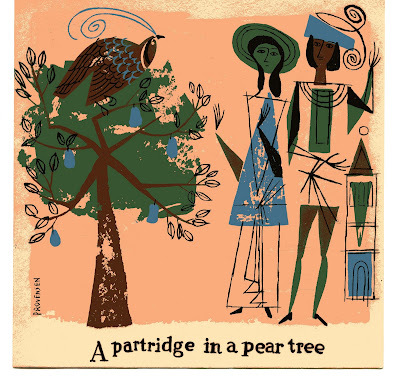 This post marks the 1st of 8 displaying these original silkscreen Christmas cards courtesy of Martin and Alice Provensen. These were quite the thrift store find spotted by Conn's keen little eye back in the day as a gift pour moi. You may be asking why 8? Aren't there 12 days of Christmas? I thought I scanned all 12 cards and the back showing the credits but 9-12 may have fallen victim to Laptop Meltdown 2008. I'll see if I can hunt them down before January 2 (That's the 9th day of Christmas for the math-challenged) For more of Alice & Martin's work, check out this blog post featuring their Golden Treasury of Myths and Legends and also, there's always Flickr. The 12 Days of Christmas local style!